by libyaobserver.ly --The Libyan Foreign Ministry of the Presidential Council has called for explanation by the Lebanese authorities for the desecration of the Libyan flag and the threats against Libyan delegation which was supposed to visit Beirut for the Arab Summit for Economic and Social Development. The Foreign Ministry urged in a statement Monday the Arab League to take a clear stance regarding the Lebanese conduct, expressing dismay at the disrespectful acts by Lebanon, which made Libya boycott the summit. "The Lebanese president Michel Aoun invited the Head of the Presidential Council Fayez Al-Sirraj to attend the summit and he accepted." The statement said. The statement also voiced utmost rejection to the desecration of the Libyan flag and other acts by protesters and representatives of the Shiite Amal Movement. "We have found the contradictory statements of the Lebanese officials very strange regarding the participation of the Libyan delegation at the summit, not to mention the lack of preparations for the reception of the delegation if arrived." The statement adds. 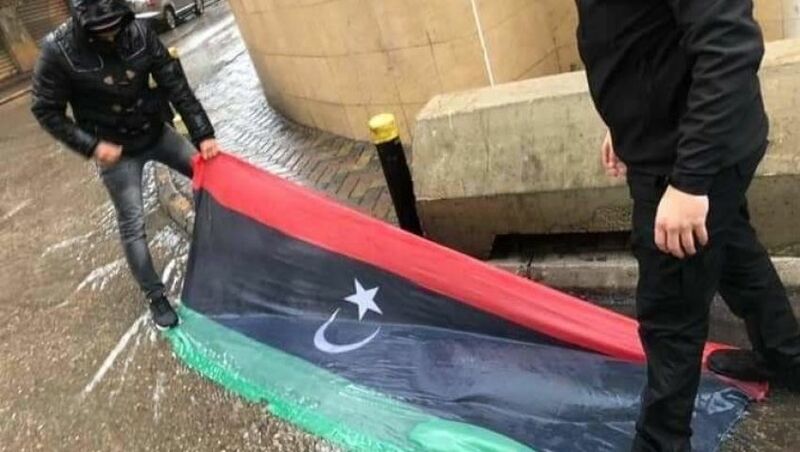 A video posted on YouTube on Sunday showed a group of Shiite protesters taking down the Libyan flag from the street, ripping it up and replacing it with the flag of AMAL Movement, a Lebanese political party associated with Lebanon's Shia community. The protesters threatened a day earlier to stage nationwide protests to close the airport in a bid to prevent the Libyan delegation from taking part in the summit. The summit is scheduled to be held in Beirut on Jan. 19-20, but Nabih Berri, who heads AMAL Movement, is rejecting to invite Libya because of the disappearance of Shiite cleric and founder of the movement Moussa al-Sadr in Libya in 1978.